As a business owner or manager, you've got plenty to take care of after a long day's work. 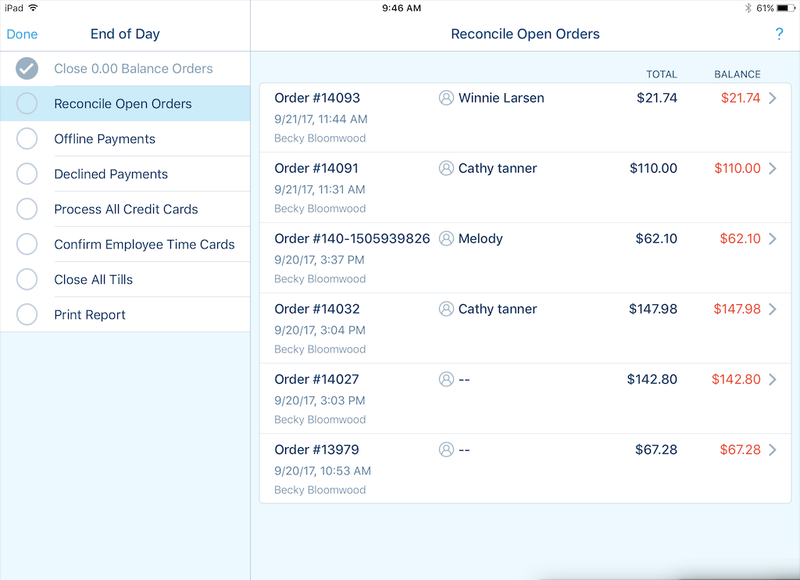 Let Revel lighten your load with our powerful End of Day wizard— quickly close open orders, process offline payments, confirm time cards, and more. Only employees with the proper role and permission settings have access to run the End of Day process. Log in to your Management Console ([yoursubdomain].revelup.com). Click Clear Selections and then type End of Day in the search bar.. Check the box for End of Day from the left-side bar. 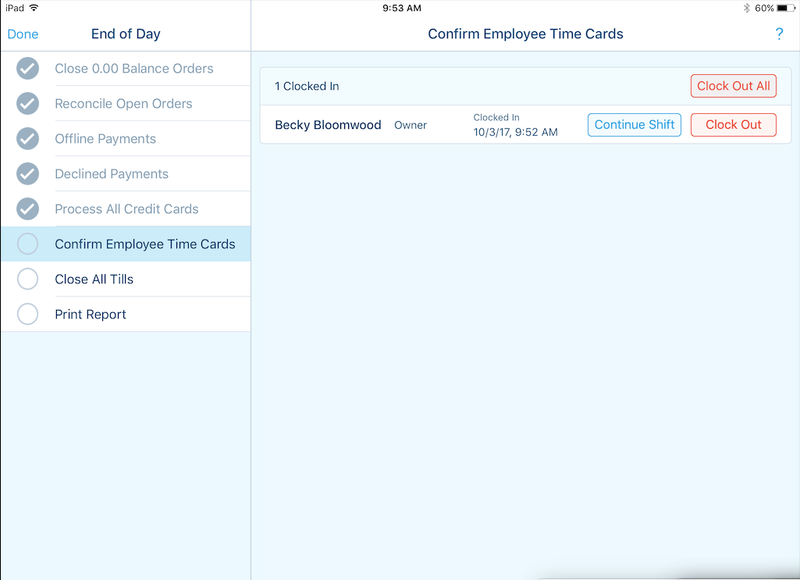 If you would like to trigger a reminder on the POS for employees to run the EOD process, you can use the Reminder Time field to set one up. 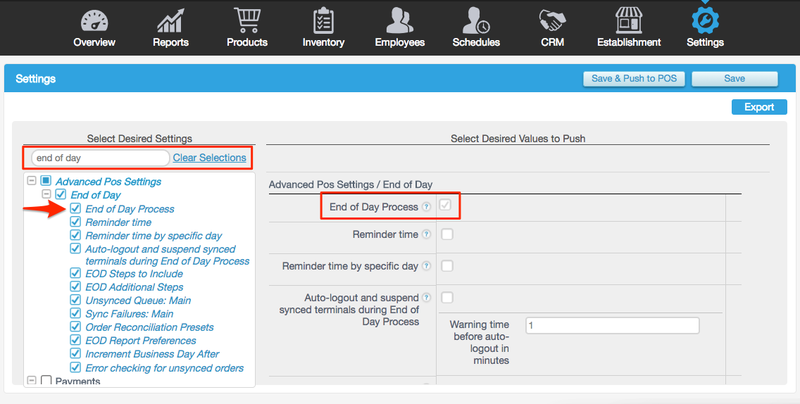 You can also use the settings in this section to customize your End of Day process to fit your business' needs. 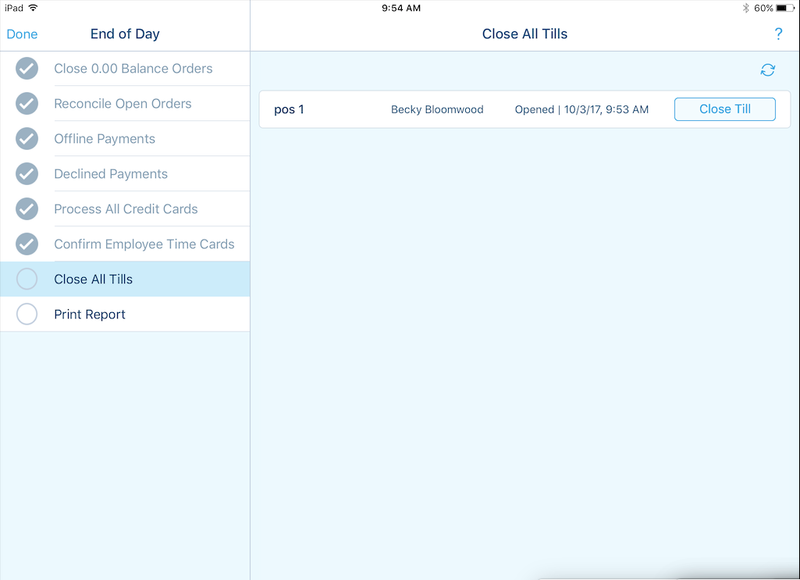 Revel's End of Day wizard runs right on the POS, guiding a manager/employee through predefined, configurable closing steps. An End of Day report records the results of the process, including the name of the employee who ran it. From the Dashboard screen, tap End of Day Process. The process will start running. Details about each End of Day task follow. This is the first step that must be taken to initiate the End of Day process. If any orders are currently open, but they are paid in full, the system will automatically close them and the Close 0.00 Balance Orders box will be checked. Tapping an order will take you to the order screen, where you can then pay out the order, void it, or comp it. 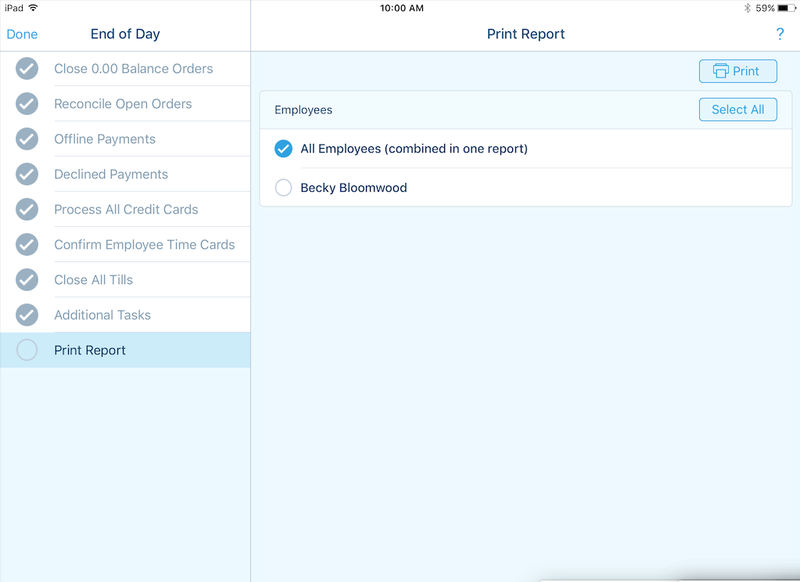 Once you are done processing that particular order, you will be taken back to the End of Day screen. This screen allows you to view and process any payments that were recorded while the POS was in Offline Mode. The screen lists the transaction ID number, the cardholder's name (if the customer is saved in the system), the last four digits of the card used for the transaction, the date and time of the payment, and the total amount of the payment, including any tips. Tapping the Force option at the top of the screen will process the listed offline payments. If any payments are declined, they will be moved to the Declined Payments screen. If the POS is still in Offline Mode, the End of Day process will not be able to be completed. You will see an error window, and will need to reestablish your connection to continue. This screen allows you to address and resolve any payments that were declined. The screen displays the same information about the payment as was shown in the Offline Payments screen, along with the reason why the payment was declined. This could be due to an invalid card number, for example. Tapping the Retry button will cause the POS to try to process the payment again. If the payment is still declined, you will need to swipe right to delete the payment from the table in order to continue with the End of Day process. If the Delete option is selected, you will see a warning confirming that they are about to delete the payment. This screen allows you to process all credit cards used for transactions. The screen displays all information about payments processed on a credit card (same information that was listed in the Offline / Declined Payments pages) along with the payment status. You can add any additional tip amount in the Tip field. Tapping the Capture button will bring up the Capture All Transactions window confirming the capture of the card. 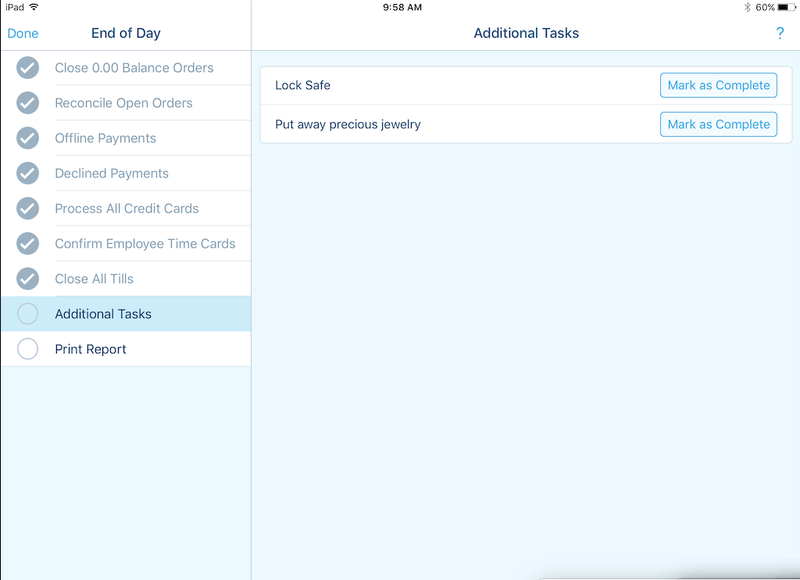 Once the End of Day process is complete, the POS will automatically log you out and refresh.